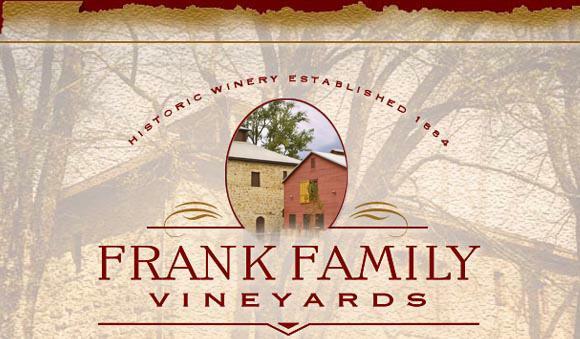 Housed in the historic Larkmead winery in Napa Valley, Frank Family Vineyards produces wines that live up to the heritage of the land on which they are produced. Our wines are handcrafted in small quantities and are only sold at the winery and in a handful of select restaurants and retailer's. It's no wonder that Rich Frank, one of Hollywood's most creative, vibrant and ingenious players owns one of Napa Valley's most unique wineries, Frank Family Vineyards. In the late '80s, Rich, a long-time Disney executive, couldn't find the time to get away for long vacations. Soon he started coming to Napa on the weekends, realizing it was only a short plane flight away from Los Angeles. In 1990, he purchased a home in the eastern hills of Napa in Rutherford. Two years later, in 1992, Rich received a midnight phone call at his home in Los Angeles from a friend, telling him that the Kornell Champagne Cellars on the site of historic Larkmead Winery was for sale and, if there was ever a time to get into the wine business, it was now. Rich, unsure of entering the business full-swing wisely offered half the asking price, and less than 24 hours later he was an owner of the Calistoga winery. Rich's passion for the Napa Valley and Frank Family Vineyards underscores a wildly successful, long-term career in Hollywood. He was Chairman of Walt Disney Television and Telecommunications and headed Disney's syndication arm Buena Vista. He was then President of Walt Disney Studios for nearly a decade and oversaw the development of The Disney Channel. Prior to his tenure at Disney, Rich was President of the Paramount Television Group, President of Chris Craft Television, one of the founders of the USA Network and also served on their board. Under Frank's leadership, television and movie properties such as "Cheers," "Taxi," "Family Ties," "Shogun," "Winds of War," "Entertainment Tonight," "Golden Girls," "Home Improvement," "Ellen," "Regis and Kathy Lee," "Dead Poet's Society," "Good Morning Vietnam," "Pretty Woman," "Father of the Bride," "Aladdin" and "The Lion King" achieved phenomenal success. He also launched Telerep, a television ad sales firm, and was a buyer and media planner at BBDO. Rich was President of the Academy of Television Arts and Sciences for an unprecedented six years, a board member of the MPAA for eight years and is currently Vice Chairman and Executive Board Member of the American Film Institute. In 2007, the Television Academy showed its appreciation for Rich's contributions by awarding Rich the Syd Cassyd Founders Award, only the eighth time the Academy has bestowed this prestigious honor. In June of 2011, he received an Honorary Doctorate degree from the American Film Institute (AFI), along with Helen Mirren and Spike Lee. Rich is a partner and currently provides executive producing and consulting services for Prospect Park, a talent management and production company focusing on music, film and television that was founded in 2008. Through Prospect Park, Rich is currently Executive Producing "Royal Pains" on the USA Network, and "Wilfred" on FX, along with his son, Paul. He also recently formed The Online Network, reviving popular soap operas "One Life to Live" and "All My Children" in April 2013. Before his association with Prospect Park, Rich merged his brand, advertising and marketing strategy company, Integrated Entertainment Partners (IEP), into The Firm, one of Hollywood's largest and most successful talent management companies, where he was named Chairman. The Firm was launched in 1997 by Jeff Kwatinetz, and made its most significant acquisition in 2002 when it bought the assets of Artists Management Group. Additionally, Rich sits on the board of Ecoya and Napa Style. Never one to rest on his laurels, the former adman turned Hollywood film and TV exec, stepped into his role as Napa Valley vintner with ease and is actively involved with the winery operations. Rich is the proud grandfather of four. His son, Paul Frank, is Executive Vice President for Prime Time programming for BabyFirst, and son Darryl is Co-President of Dreamworks Television. Rich splits his time between Los Angeles and Napa with his wife, Leslie Miller, LA's most beloved ABC7 reporter, until she recently left to host "MORE One Life to Live" and "MORE All My Children" for The Online Network. Leslie's natural curiosity and desire to see the world and enjoy all that it had to offer led her to a career in Journalism, that interest in a life well-lived also included wine, which was the reason for her first visit to the Napa Valley back in 1990s. There, it was love at first sight. Born in Hamilton, Ontario, Canada, Leslie is an Emmy-award winning television news anchor and reporter. Working in television news markets across Canada and in the United States, Leslie spent years on the ground covering some of the biggest stories of the last two decades, including the 9/11 attack live from NYC to the devastating aftermath of Hurricane Katrina to the Michael Jackson trial. She spent the last nine years of her TV career at the number one rated KABC in Los Angeles. In 2013, Leslie proudly became a US citizen after living in the country for fifteen years. Now instead of covering the news on television, Leslie spends her time promoting the quality Frank Family brand lovingly created by her husband, Rich. Leslie and Rich are honored to travel extensively around the world, sharing their love and passion for wine. Today, as a proprietor of Frank Family Vineyards, Leslie and her husband Rich enjoy spending time at their home on Winston Hill in Rutherford along with their German Shepherd Riley who can often be found greeting guests at the wineries tasting room. After twenty years of working as a winemaker in every corner of the world, Winemaker Todd Graff landed at Calistoga's Frank Family Vineyards in 2003, just an hour drive over the mountains from his hometown of Petaluma. He has yet to look back. At Frank Family, he has applied his deep expertise in making both still and sparkling wines to the portfolio, and has been an integral player in defining Frank Family's reputation as a world-class producer of Napa Valley Cabernet and Chardonnay. He also directed the construction of Frank Family's new state of the art winery in 2007. Todd was drawn to winemaking at a young age and signed up for an introductory wine course while attending Santa Rosa Jr. College. He then graduated from UC Davis with a degree in plant science and viticulture in 1984. Upon his graduation, Todd circled the globe working for great producers. He worked in the cellar at Joseph Phelps Vineyards before navigating the steep slate vineyards at Weingut Klaus Schweicher in Mosel, Germany, the sandy soils of Château Yon-Figeac in St.-Emilion, France, and the decomposed granite and sandstone loam soils at Arrowfield Estate in Australia's Hunter Valley. Todd returned to the Napa Valley in 1987 to work as an Assistant Winemaker at Stag's Leap Winery, and from 1990-95 was the Assistant Winemaker and Vineyard Manager at Schramsberg Vineyards, where he honed his craft in making sparkling wines according to the méthod champenoise. During his tenure at Schramsberg, he also served as Technical Director and Winemaker at Caves Transmontanas in Portugal, a Schramsberg joint venture. In 1995, Todd joined Cordoniu in Napa (now Artesa) as Sparkling Winemaker, and in 2000, he joined Sonoma Creek Winery as Winemaker, where he cultivated strategic relationships with grape growers and was a key component of the winery's executive management team. Under his leadership, Sonoma Creek's production increased by 30%. Todd is a member of the Napa Valley Wine Technical Group and the Napa Valley Vineyard Technical Group. When he's not at the winery with his chocolate Labrador, Bristol, in tow, he enjoys spending time with his three children and coaches their Little League teams. He is also an avid mountain biker and fly-fisherman. Winston Hill-Rising nearly 500 feet above the valley floor in the prestigious Rutherford viticultural appellation, Winston Hill is located along the east side of the Napa Valley along the Vaca Mountain range. Winston Hill is located on owner Rich Frank's personal estate. The soil consists of well-drained, volcanic deposits and sandstone. Due to its southwest exposure, Winston Hill has a high radiant value. Typical warm summer days give way to cool nights with soft mountain breezes. The vineyard has an average rainfall of 24-36 inches per year. Approximately 20 acres of vines were planted on Winston Hill starting in1991. Cabernet Sauvignon is the primary variety, along with small amounts of Merlot, Cabernet Franc, and Sangiovese. Through site specific vineyard management, several clonal selections are matched with the appropriate rootstocks. Extensive hand labor balances the vine canopy and maintains the yields to produce rich and concentrated wines. Winston Hill produces its namesake wine and the flagship for Frank Family Vineyards along with being the foundation for our Rutherford Reserve and Napa Valley Sangiovese. Lewis Vineyard-Located in the heart of Napa, Carneros near the shores of San Pablo Bay, Lewis Vineyards is 138 acres of gently rolling hills. The vineyard is named after Rich's oldest grandson, Lewis. The predominant maritime influence of the Pacific Ocean creates the cool temperature, fog and wind that make Carneros ideally suited for the growing of world class Chardonnay and Pinot Noir grapes. Lewis Vineyard consists primarily of shallow dense clay loam soils and receives only 20 inches of rainfall annually. Overall the maritime influence and the restricting soils result in extremely low yields, producing grapes with strong character and balanced acidity. The practice of cool climate viticulture and the planting of small cluster Dijon clones contribute to an intensity that is unmatched in the Chardonnay and Reserve Pinot Noir of Lewis Vineyards. S&J Vineyard-Adding to Frank Family's vineyard diversity are 75 acres planted to the S&J Vineyard, located east of the Vaca Mountain range in Napa's Capell Valley. The vineyard, purchased in 2000, is named for Darryl's kids, Stella and Jeremy, and is planted to mostly Cabernet Sauvignon, along with small quantities of Petite Sirah and Zinfandel. Meticulous soil and microclimate studies were executed before the development of this vineyard. The 2014 Napa Valley Zinfandel is garnet in color, and opens with aromas of raspberries, vanilla, and earthy dried herbs notes. Medium bodied on the palate with an abundance of fresh fruit and black pepper ﬂavors on the entry, this wine is round, silky, and ﬁnishes with ﬂavors of ripe blackberries. Pale yellow in color with aromas of white flowers, stone fruit and lemon zest. The finish boasts the essence of vanilla. The palate is lush with lychee fruit and toasted almonds finishing with bright, mouth watering acidity.